I joked last night on twitter that the act of writing is a matter of figuring out which order you should cruise your social media sites, and this morning, I’m caught in that very trap. I really do need a large five-minute timer with electrical leads running from the back of the case to my scrotum. Five minutes! DING! ZAP! Otherwise, the day gets away. That said, yes, I’m on tumblr. It is one of the ugliest themes you can possible install, but I spend all my time in the dashboard which is much nicer. I need to figure that out still. And I need to update my website because it is well past time to give it a bit more functionality. Not to mention making it easier to find this blog, because otherwise, I’m just talking to myself. I still might be, but there will be the slight illusion that others might stumble upon it. Speaking of stumbling upon things, the first part of my short story collection is out in ebook land. 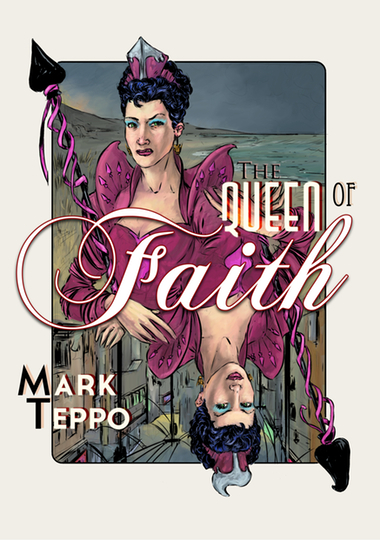 Called The Queen of Faith, it’s a half-dozen stories culled from various places over the years, including my first professional sale, “How The Mermaid Lost Her Song.” The above link will take you to the product page, where you can find links to various places to pick it up. The cover art is by Neal Von Flue, my eternal partner in crime. One of these days he and I should get in the same room and have a beer or two. There’s a general sense of dusting things off and cleaning out the cruft from the shelves around here. There has been a lot of deadline chasing in the last three years, and I can’t complain about the output, but it has meant that I have spent way too much time locked in the quintessential writer’s dungeon, banging out words. I think I’ve figured out how to bang out words pretty well now–some of them form reasonable coherent sentences, even–and it’s time to put this experience to use. Last night, I sat down and banged out a thousand words for a new prologue to HERE BE MONSTERS. It’s in a much different voice and tense than the previous draft of the opening chapters, and I’m going to give some thought to applying this style to the whole book. I’ve been castigated a few times over the past few weeks about shirking my duty to write the books I want to read, and so this may have been part of my reticence about this project. Hopefully this new approach will be more exciting.